You want the “Cliff Notes” version. In other words, the 20% that will give you 80% of the results, and not a bunch of minutia with 30 to 50 pages of fluff that you have to sift through to find the helpful tips or key points. Your “golden” opportunity may turn to “lead” if you don’t know where to find the hidden problems, undiscovered issues, and value creation opportunities an investment may hold. Much money can be saved and made by learning how to do it properly. 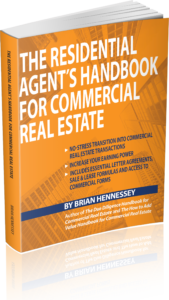 One of the biggest trends in the commercial real estate industry is the amount of transactions being done by residential agents The Residential Agent’s Handbook For Commercial Real Estate helps the residential agent demystify the commercial end of the industry. It makes it easy to understand and shows how easy it can be to create another income source. If you ever wanted to know more about how the commercial side of real estate works and the way you can start earning some big money in it, this is the book for you.